Minor Planet (130) Elektra approached the magnitude +11.6 star TYC 0408-00029-1 from the southeast and this 12.2' x 6.3' field shows two drift scan exposures of 40 seconds each, the first 47 minutes before the occultation shows the faint trail of Elektra just south of the star. The next 40 second exposure shows the moment that Elektra passed exactly in front of the star, blocking the starlight out for 17 seconds revealing Elektra shining faintly in the gap of the star trail. 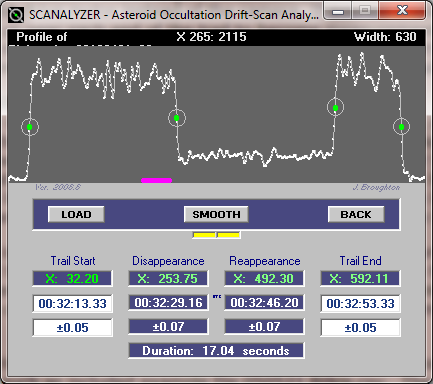 More than 40 positive results were reported for this occultation, allowing a very good silhouette of the asteroid to be determined and comparison to the best shape model available prior to the event, see the euraster.net result below. This is the second occultation of (130) Elektra recorded at Great Shefford, see the results from the other event in 2010 here.